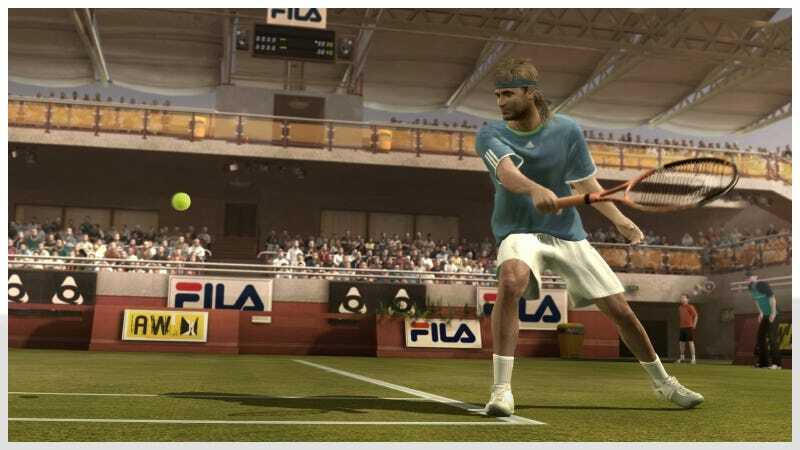 Well regarded as a series, Top Spin's last entry in 2008 took some risks that were, in hindsight, inadvisable for an American-published game simulating a sport that has lacked a dominant American men's professional for several years. 2K Sports' Top Spin 4 puts a focus back on playability, aligned to a sport that's seen growth in participation, if not in domestic television exposure or sports media heat. In my hands-on preview earlier this week, Top Spin 4's philosophy was described to me in the terms of a fighting game. For example, no matter your level of exposure, everyone can jump into Street Fighter IV and kick and punch, realizing that more, eventually, learning sophisticated moves will be necessary. But for complete beginners there's no real barrier to play. Unfortunately, there was in Top Spin 3. The timing system of Top Spin 3's face-button commands, roundly panned as inscrutable and off-putting to new adopters of the series, is gone this year. 2K Czech, the studio taking over the project from the shuttered PAM, has taken a multilayered approach that lets everyone on the court to whack balls around if they like, while making it clear that learning shot type, selection, and playing to your player's strengths, is the key to winning big matches. In Top Spin 3, everything was an advanced technique from the beginning. Standard forehands and backhands - the basic kick and punch - were difficult to grasp because they depended so much on when a face button was released rather than pressed, a counterintuitive act. In Top Spin 4, a quick flick on the A button (X in PlayStation 3) will still produce a shot that keeps you in the game. It won't have much behind it, but it's better than Top Spin 3, when many novices were frustrated by making simple returns, especially under duress. Top Spin 4 will also do a better job of telling you what kind of swing you're implementing. Last time, you were shown the aim direction, type and power of your previous shot. In Top Spin 4, you'll get onscreen cues signifying your current shot type, represented either as a filled-in dot (a powerful swing) or a crosshairs (weaker, but more accurate). A yellow X also indicates the bounce point of the incoming ball, aiding players in positioning. The shot variety goes slice (X-square), topspin (B-circle) or lob (Y-triangle) with the right trigger/R2 as a modifier (drop shots were trigger-X, for example). Those are the basics. The game this year will include a breakdown for each of its 25 pros that, in addition to ratings, provide three one-line attributes that are more than an analysis, they're a specific attribute within the game. "Diesel hard hitter," "shot counter," "monster defense," or, for Andy Roddick, "highly flammable," tell you about your opponent's game and get you thinking about how to manage it. Playing against a user-controlled Rafael Nadal with Roger Federer, I didn't take a game off my opponent in the first set, but fought back to force a tiebreak in the third once I realized that playing a baseline game against Rafa was only tiring me out. I started mixing up my shot type with slices and coming to the net. In a Pete Sampras-Andre Agassi matchup, with me taking Agassi, the AI played Sampras' serve-and-volley game to type; I responded with lobs, sending Sampras back to the baseline on lung-bursting runs for a point full of drama. And that's where Top Spin 4's other noticeable improvement came to the fore: The crowd is livelier. 2K Czech has worked in reactions that get progressively more intense, giving a sense that the spectators actually are watching. As Sampras sprinted back to the baseline to keep the rally alive, fended off a smash to prolong it and then won it with a torpedo down the line, the patrons at Arthur Ashe Stadium (one of seven licensed venues) got louder, punctuating the hard-fought rally with a long roar. There is no broadcast commentary in the game - possibly because the most identifiable voices of the sport have contracts with ESPN, which has an agreement with 2K Sports' competitor. For a genre warring between simulating what one plays and what one sees on television, I didn't miss it that much. Though 2K Czech says they're opting for creating an immersive you-are-the-player experience as opposed to being a spectator to your own performance, there are some awkward silences, especially in pre-match animations where you are a viewer, watching your player enter the court. Of course, with no commentary, you'll notice things like crowd "sweeteners," the linesmen's calls, and the chair umpire speaking in French at Stade Roland Garros. 2K Czech also says it doubled the animations it filmed for the game, from 4,000 to about 8,000, to make the players more fluid and less poppy from context to context. It'll also serve up some signature shot types within context, like Agassi's one-foot backhand, Nadal's lariat baseline forehand, or Boris Becker diving at the net. On clay, players will plant their feet and slide in a cloud of red dust, and get grimier and sweatier as a match progresses. Players get three of the four slams - the Australian, U.S. and French Opens, with Wimbledon remaining aloof to video games. It's replaced by a fictitious court in Ireland for the mid-summer slam event in your career mode. O2 Arena in London and the ATP World Tour Finals is in the game, as are the BNP Paribas Open at Indian Wells and the Sony Ericsson Open in Florida. As one of the novices who tried the Top Spin 3 demo and said the hell with it, Top Spin 4 does much to bring new or less knowledgeable players back to the fold. Experienced fans or those who did master the controls of the previous game may not see much more than roster additions and a coat of polish. 2K Sports has promised to show more of the game's features, such as PlayStation Move support and the game's career mode, in February. At first blush, though, Top Spin 4 still looks like a baseline winner, and when it gets here March 15, it should be a solid option for simulation sports fans looking for variety outside the big five of team games.